Madonna is set to vogue her way around the world on her MDNA concert tour, which kicks off Thursday in Tel Aviv — and she’s enlisted a cadre of designers to create an array of showstopping looks for the stage. The original Gaultier design is worn during the “Vogue” number and includes a white shirt, black tie, opera-length black gloves and a rigid skeleton corset. The getup references the iconic pink bustier-with-pin-striped suit look the designer created for Madonna’s 1990 Blond Ambition world tour, widely considered a pinnacle of both of their careers. “We played with the ideas of a suit and a corset. But the corset is now like a cage. What I have done this time is a nod to the conical bra corset of the Blond Ambition tour but reinterpreted in 3-D, in patent leather on the outside with metallic leather on the inside. It’s all about masculine and feminine, Madonna and Jean Paul Gaultier classics reinterpreted for 2012. Prada created high-heeled shoes for the male dancers in the gender-bending “Vogue” performance, which includes imagery of the Vogue magazine logo on massive video screens — similar to Madonna’s Super Bowl performance of the song, which was viewed by 117 million people. “This show is epic and bigger than anything she’s done before. There are many more costume changes. We’re taking 700 shoes on the road. Madonna changes outfits seven or eight times and the dancers change 10 to 15 times, depending on the dancer. 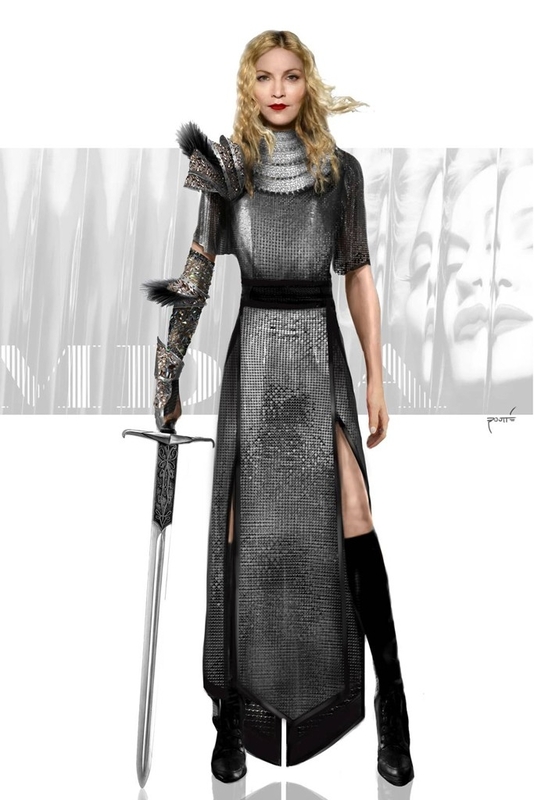 Phillips, who has done the costumes for Madonna’s four previous tours, designed a number of looks herself, delivering a wide range for her famously chameleonlike boss. The lineup veers from a forbidding Joan of Arc-inspired outfit fashioned from metal mesh and Swarovski Elements to a vernal, miniskirted majorette getup for the 53-year-old “Girl Gone Wild” singer. “It’s inspired by a 1940s majorette and I was looking for something playful and fun. The show explores the idea of stripping away layers of identity and discovering the layers of who you are. This is her brainchild and her concept. We have a 15-year relationship and there’s a rhythm to how we collaborate. She’s very open-minded but she expects a lot. Masks are a big component to many outfits, with dancers hiding their faces behind gargoyle and bunny guises. There’s a menacing streak to some looks, with themes of violence explored in certain segments, which are accessorized with swords, guns, armor and holsters. As for the media dustup this week when Madonna supposedly lobbed a grenade at Lady Gaga by mashing up her own “Express Yourself” with Lady Gaga’s allegedly reductive “Born This Way” in rehearsals, it wasn’t just a ploy for attention and it’s part of the permanent show. At the end of the song, Madonna throws in the line “She’s Not Me,” from her recent song of the same name.